Title page of Dialogo di Galileo Galilei sopra i due massimi sistemi del mondo tolemaico, e copernicano, 1632. Click to enlarge. February 15, 1564, is Galileo’s birthday according to the Julian calendar; in our Gregorian calendar the date is February 26. Our collections hold two of his books published during his lifetime: Dialogues on two world systems, Ptolemaic and Copernican (1632) and Discourses on two new sciences (1638). The first was the book that got him into trouble with the Church, eventually leading to his sentencing and house arrest for his defense of Copernicus’ sun-centered astronomy. The second was in a sense his vindication, a physical treatise that was a summation of his investigations into the strengths of materials and the motions of bodies. As Galileo was forbidden to publish, the manuscript was smuggled abroad and appeared in Leiden, away from the censoring arm of the Church. The mid-nineteenth century saw a flowering of biographical works on Galileo and other scientists. Biographies of scientists allow many things to happen: first of all, they become the occasion to do some popular science writing. Second, they often lend themselves to a progressive narrative, positioning a discovery, insight, or theory into a triumphant march of knowledge and improvement, undertaken against regressive forces of oppression. Finally, biographies provide narratives that shed light on individual motives and character, holding up personal qualities as keys to broader cultural and social understanding. Galileo Galilei (1564–1642). 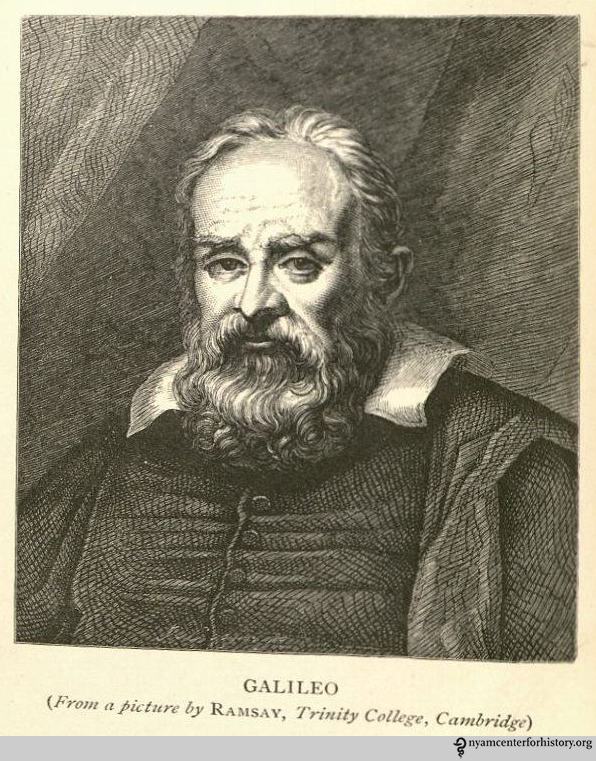 Frontispiece of Allan-Olney, The Private Life of Galileo, 1870. Nineteenth-century biographies of scientists did all three. But often they did so in ways that defy our expectations. 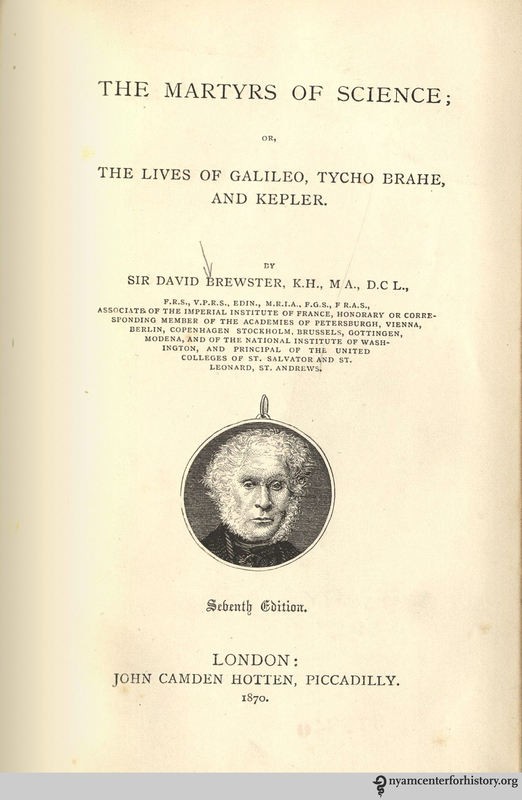 Title page of Brewster, The Martyrs of Science; or, The Lives of Galileo, Tycho Brahe, and Kepler, 7th edition, 1870. After Brewster’s book, Galileo studies began in earnest, notably in Italy in the 1850s and ’60s. Of particular interest was Galileo’s correspondence with his daughter, a Franciscan nun, Suor Maria Celeste.3 Twenty-seven of her letters were published in Florence in 1852, and 121 in 1863. The correspondence formed the basis for an anonymously published biography, The Private Life of Galileo (1870). 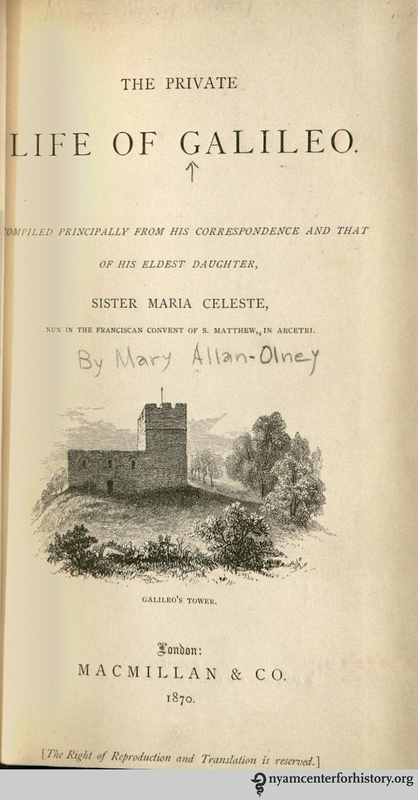 The author was Mary Allan-Olney, an Englishwoman, about whom nothing more has been found except her books: the novels, Junia (1878), Estelle Russell (1880), and Harmonia (1887); a two- volume travel narrative of life in Virginia under Reconstruction, The New Virginians, (1880); and The Private Life of Galileo. Title page of Allan-Olney, The Private Life of Galileo, 1870. “Galileo’s Tower” is his house at Arcetri, outside Florence, adjacent to the convent where his daughters resided, and where he remained under house arrest after his condemnation. Allan-Olney focused her biography on the celebrated trial. The biography’s backdrop was the first Vatican conference, running 1868 through 1870, which affirmed the infallibility of the Pope. She wrote that Galileo’s sentence had not been signed by the Pope, thus leaving it in the realm of the fallible!4 She concluded her book with two appendices, translations of the Inquisition’s sentence and Galileo’s abjuration. 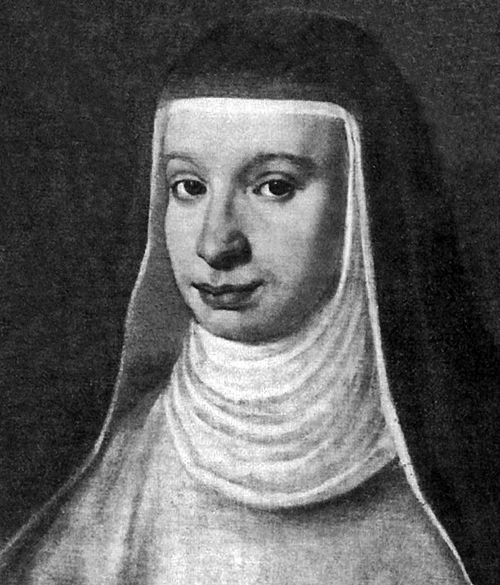 Galileo’s daughter, Suor Maria Celeste (1600–1634), via the University of Maryland. To this day, Galileo sparks interest—two major biographies were published within the last five years.9 And, like these two 19th-century authors, each writer needs to come to terms with the man behind the story. Only these days, character is not held to be the key. 1. Brewster, Martyrs, p. 94. 2. Brewster, Martyrs, pp. 117–18. 3. Letters to Father: Suor Maria Celeste to Galileo, 1623–1633, translated and annotated by Dava Sobel (Walker Publishing Co., 2001), especially p. xiii. 4. Allan-Olney, Private Life of Galileo, p. 260. 5. The stretching of Galileo’s life to fit a mid-19th-century ethic shows its strains. The hero of this story, Galileo, showed his concern for his daughters—all three of his children were illegitimate, but his youngest, a boy, was legitimized to allow him a place in society—by placing them as vowed nuns in a monastery when they were 13 and a bit younger (the birthdate of the second daughter is in doubt). The letters between Galileo and his oldest child show signs of real affection, though, which Allan-Olney then uses as the center of her work. 6. These are chapter subheads in Private Life of Galileo. 7. Allan-Olney, Private Life of Galileo, p. 208. 8. Allan-Olney, Private Life of Galileo, p. 298. 9. John Heilbron, Galileo (Oxford: Oxford University Press, 2010); and David Wootton, Galileo: Watcher of the Skies(New Haven: Yale University Press, 2010). This entry was posted in Collections and tagged biography, David Brewster, Galileo, history of science, Mary Allan-Olney, science writing, The Lives of Galileo Tycho Brahe and Kepler, The Private Life of Galileo by nyamhistorymed. Bookmark the permalink. Do you suppose Dava Sobel used Allan-Olney’s book as a guide when writing “Galileo’s Daughter?” That is a marvelous book, and it didn’t shy away from the complexities of Galileo’s character. Ms. Sobel lists the book in her bibliography, so she used it and no doubt learned from it, but she also tells her own story!